Three God-Honoring, Gospel-Sharing, People-Reaching, Trustworthy Places to Give Today. Today is a great day for giving. In fact, Facebook will even MATCH YOUR GIFT today if you are a patron of their social media market. But how do you know where to give? There are only so many dollars in your wallet for charity. What are the places that will give you the most BANG for your Gospel-Sharing, God-Honoring BUCK? We decided to set out to become more involved in four organizations greater in scope and capable of accomplishing more exponentially than we could alone. These are trustworthy organizations that work to accomplish more than we can ask or imagine for the Glory of God. In their given mission, they seek the Kingdom first. They also serve man by meeting needs, sometimes physical, sometimes spiritual. Let me quickly share them with you and provide information for how you can give on three I would recommend today. Everything Bible.com provides is free! They are expanding constantly. The organization is amazingly innovative and I cannot say enough good about what they do. Yes, I am a contributor. But we also work for free, as do the translators. If you are looking for a way to maximize your dollars for getting the Bible into the hands of people — or helping them engage more with the Bible— this is a viable option. We completed all of our adoptions through American World. It’s a God-honoring well-respected Christian agency here and around the globe. It is also the agency Stephen Curtis Chapman used for their first adoption, as well as other well known artists in Christian music. I have nothing but good to say about our experiences and have heard nothing but positive feedback from other families. Everywhere I speak, I am asked about my experiences with adoption and the most expressed sentiment is how others want to be a part but NOT LIKE ME. They care about what God cares about. Their heart breaks for the plight of the orphan, but they are not able to adopt one, two or six children. Right now – I believe any funds given until December 1 will be matched. 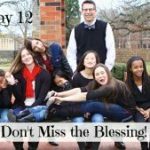 Go to the website if you have been looking for how you can get on board with caring for orphans — this it it! I am totally thrilled about this program and I cannot wait to see all that God does in His time with His resources — using His people! So give. Samaritan’s Purse is busy doing many things across the globe. Not only do they meet the needs in light of catastrophes, they provide gifts to children. But that’s not all. They also share the Gospel message and provide the means for discipleship in the areas they travel. But because the organization has earned such a positive reputation for humanitarian aid, the doors are more easily opened for accessing hard-to-reach areas for the Gospel. They have made huge strides meeting the needs of man for the Glory of God — while sharing the Good News of Christ. This is something I can get behind with my dollars and know that they will use it well. 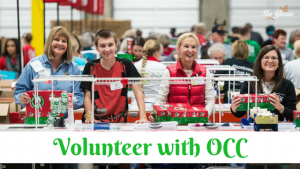 Also, you can volunteer your time at an Operation Christmas Child Processing Center. 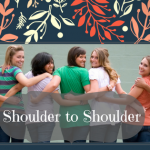 That’s what we are doing in Dallas, December 17, 6-9 pm as a She Yearns team! Comment Below if you would like to join us! As you prayerfully consider your giving options today and in the future, please keep these three organizations in mind. They are doing good work for the Kingdom.